Comet 208301A - Comet 102C Uncalibrated drive clutch. NO cam arms or spring. Home > Comet Clutches and Parts > 216097A Comet 102C Clutch Puller Tool. Used for 1995 and earlier. > Comet 102C, Part 208301A - Uncalibrated drive clutch. NO cam arms or spring. 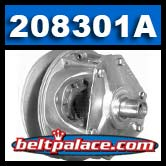 Comet 208301A - 102C Uncalibrated drive clutch. NO cam arms or spring. Comet 208301A, Model 102C - Uncalibrated drive clutch. Cam arms and spring sold separately. Fits vintage-modern Yamaha snowmobiles and suitable for custom applications requiring long life, rugged design, and adaptability. 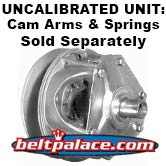 Recommended calibration: Add Qty (3) 211333A "F-2" cam arms, Qty (1) 204818A silver spring - SOLD SEPARATELY. Lightweight, yet solid design. Superior engineering! Adjustable to 1-15/64" to 1-1/4" belt widths. Adapts to your engine's power curve with optional spring and cam arm kits. ***$271.78 USD SPECIAL "NEW-OPEN BOX" PRICE WHILE SUPPLIES LAST! Contact us for further info and ordering assistance: 317-519-9020. 216097A Comet Clutch Puller Tool. Used for 1995 and earlier Comet Industries clutches. OEM Comet Part #: 216097A.